It is no mere coincidence that the greatest sphere of influence towards my own self-defined geek culture stems from the eighties. That decade of retro-hairstyles, synth-rock, Bladerunner, Saturday morning cartoons, members-only jackets and mean mustaches. And Cyberpunk. Always Cyberpunk. In many ways the great eighties - the 'Greaties' have shaped my inner-nerd putty and molded it into this crazy amalgamation of nostalgic reverence towards that decade of definitive escapism. But this inspiring culture crave transcends even that. Like myself, many of us "Children of the Eighties", are obsessed with our self proclaimed fandom. We thrill at vintage artwork from our favorite childhood memories, we horde our collection of action figures and pieces of memorabilia with zealous fanaticism and we fume at every mention of that loathsome word: 'reboot'. In short we have become self-obsessed sentimental psychopaths. Hollywood and its media goons should tread carefully the fragile domain of our precious memories: Akira, The Ninja Turtles, Ghostbusters, Transformers, He-Man and The Masters of the Universe, Thundercats, Star Wars, Tron, Indiana Jones... If you're planning a reboot, rehash, remake, reinvent or whatever then make sure it works and works properly...every time. Which is most likely why the recent spate of reboots have been met with gratuitous amounts of indignation and trailer-hate. But, I rant and (yet again), I digress. For the most part, in the world of boardgames, untainted by the Hollywood sphere of influence, the nerd and geek hegemony are the primary stakeholders of this booming industry. And, it is because of their greater impact that we find excellent movie-to-tabletop conversions that transitions so well, that I find myself positively awed. 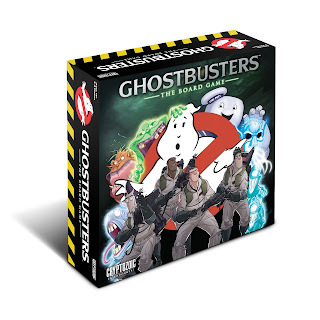 Hailed as and episodic co-op adventure game for 1-4 players, Ghostbusters: The Boardgame will have you assume the role of your favorite Ghostbuster while rushing around the city blasting ghosts and sealing gates to the spirit realm. And yes, you get to drive the Ecto 1. And yes, there is a Stay Puft Marshmallow Man. Arguably one of the most exciting parts of every boardgame aficionado's delight lies in the un-boxing and this game delivers. Cryptozoic have done and excellent job on the miniatures and cardboard components. From the artwork on the character cards of your four Ghostbusters: Peter Venkman, Egon Spengler, Ray Stantz and Winston Zeddemore; to the ghosts, ghouls and monsters, the illustrations by legendary IDW Comic Book illustrator Dan Schoening are impressive and resonates that 'Saturday Morning' cartoon vibe. The board is brilliantly drawn and is comprised of ten 2-sided tiles which are arranged together according to whichever scenario you are playing. 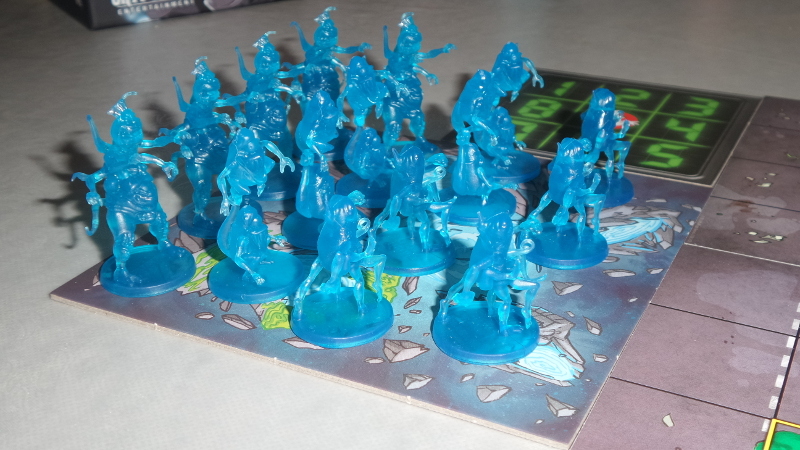 Then there are the miniatures themselves and there are loads of them! 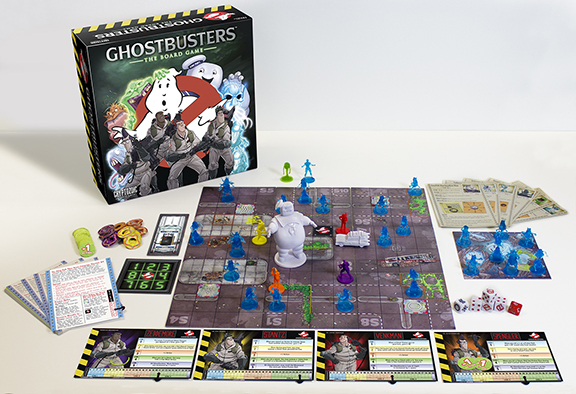 There are the 4 Ghostbusters (color co-ordinated to match their respective character cards), the Ecto 1 and 40 translucent blue ghost miniatures and a slime-green Slimer, some demon called Idulnas and a huge Stay Puft Marshmallow Man and they are all beautifully sculpted. You also get a load of proton stream and slime tokens, four proton dice, an 'event' and ghost-movement die and even a PKE meter. The rule book has a back story which sets the tone for why all the ghosts have escaped and why help is needed. Since this game is campaign/ scenario based, you basically play through each scenario and re-arrange the board accordingly. 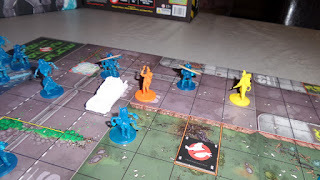 We played through the first scenario (The Slimer Situation) which had the Ghostbusters running across the city to close gates and prevent any more ghosts escaping the spirit realm. Setup is quick and involves laying out the board tiles, placing ghosts and gates at indicated positions on the board and getting Ray Park Jr cranking to set the tone for your ghost busting! Each Ghostbuster player has 2 actions which they perform. These include driving the Ecto 1 six spaces across the board, moving two spaces, removing slime tokens (if a ghost moves through your space you get slimed! ), depositing trapped ghosts back into the Ecto 1 or combating (blasting) ghosts. In addition, you may also perform one of two maneuvers such as dashing back into the safety of the Ecto 1 or depositing trapped ghosts and sending them back the the spirit realm. Combat is fairly straightforward. It's line of sight based, so if you have the ghost within your 3-space view and not obscured by any physical barriers, you may fire up that proton pack and get cracking. Okay, so all you're really doing is rolling a proton die and placing a proton stream token on the ghost...but it's all fun. Trust me. One of the best features of the game is that your character card includes an experience tracker allowing you to accumulate XP and level up to unlock new abilities. Best of all, these abilities carry through to the next campaign. You accumulate XP in various ways - by trapping ghosts with a proton stream, removing slime (Venkman) or rolling a particular die value (Spengler). The game can also be played solo although I do suggest that if you're busting solo, play with at least two characters as this supports the various scenarios more. 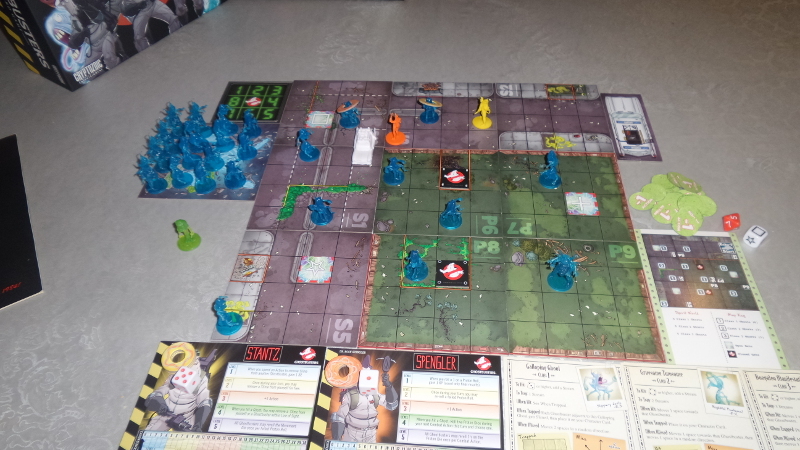 Anyone who has played Zombiecide will find similarities in this game with regards to both setup and gameplay. My only real negatives for this game is that it seems to be missing a draw factor to make a really excellent game. Scenarios can get monotonous as it follows a very similar structure of blast ghosts, trap ghosts, close gates and repeat, making it feel a lot like an arcade-style shooter instead of a full on co-op game. It would have been cool if there was an extra element of randomness to the AI which upped the environment to make it more exciting (or spooky). That said, Ghostbusters is still a whole lot of fun. It's lightweight and a great family game. The game mechanics are simple and easy to learn. We had our daughters, aged 6 and 8, play through the first scenario with us and they absolutely loved the game. It's got great theme, its loads of fun (although it can get quite harder as the story line progresses) and best of all, it does justice to the nostalgia of that eighties Saturday-morning cartoon experience.